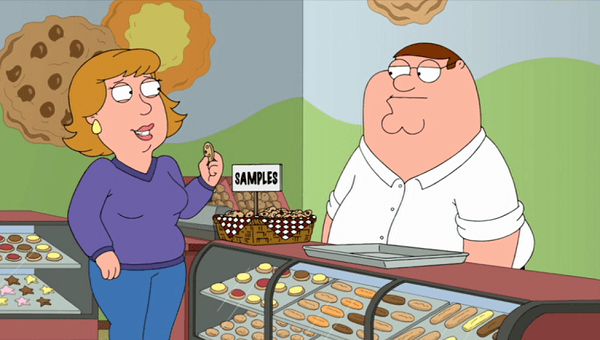 A brief summary for those who might not know – Family Guy centers around the Griffin Family of Quahog, Rhode Island. Patriarch Peter is the real star of the show and his crazy antics fuel many of the plots and storylines throughout. 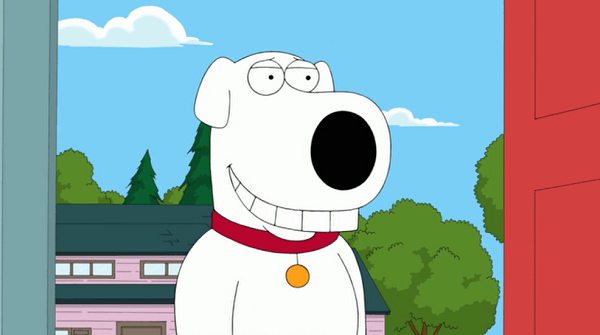 Brian Griffin is the intellectual (or so he thinks) dog of the family and is often partnered up with Stewie – the youngest of the lot who’s intelligence and drive make him one of the most dangerous people on the planet (or at least they did, now he usually just plays with his toys and cracks wise). Meg is the unwanted, unliked teenage girl of the family while Chris is the sexually charged teenage boy. They are all reigned in by their mother Lois who tries to keep some sembelance of sanity in her world. 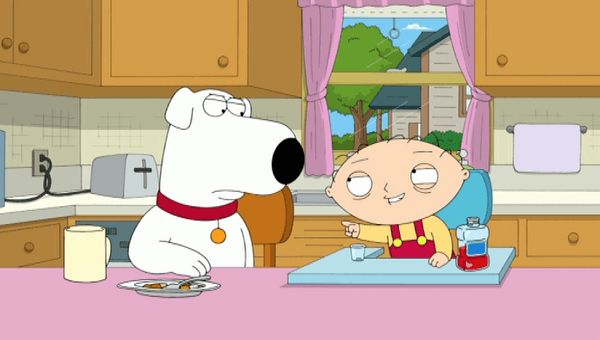 After fifteen years of storylines, Family Guy is in what I like to refer to as its “caricature” stage, where many of the characters now have personalities that are way inflated from where they began, and have become caricatures of themselves, with many of the jokes now revolving around these over inflated personalities instead of the situations that they are in. Family Guy isn’t the only show guilty of this (The Simpsons has been doing it for quite a few years now) but something about Season 15 has really ramped it up to the point where it is obnoxiously noticeable. At the same time, the focus on the outlandish personalities has also meant a bit of a deviation away from actual plot-driven stories. Don’t get me wrong, there are still a main and sub-plot for each episode but they seem to be getting thinner and thinner, with Season 15 being the worst for it. 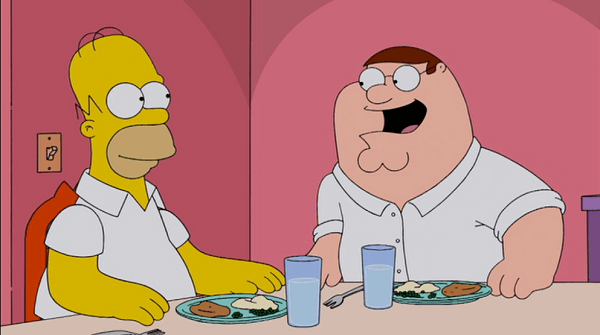 Like most TV shows, Family Guy isn’t afraid to have its stand-out episode(s) each season. Last year’s massive arc was the Death of Brian story, and this year to go one step further, the Griffin family met the often imitated but never copied; The Simpsons. This episode was met with a huge amount of fanfare when it was shown in America on television and it is easy to see why – a crossover between two of the biggest animated series of our lifetime is a huge thing and one we should get excited about. Sadly, the episode didn’t really reach the lofty heights that we all wanted it to be. In terms of this series of Family Guy being very “meta,” this is as meta as it gets. Each of the Simpsons and the Griffins were sprouting off their one-liners and reciting their classic bits in the ultimate game of one-upsmanship. References were made to how the two families were rivals, and the whole episode is capped off with a court scene that compares memebers of the Springfield populace to their Quahog counterparts. It is a fun little mixing of worlds, but it is a little ham-fisted and over the top at times. Not only that but like other episodes in the series, many of the jokes fell flat and elicited a laugh more from the awe factor of seeing these two families together than the actual comedy itself. 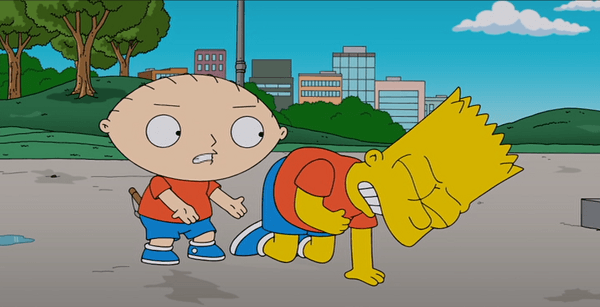 I watched the episode twice before I noticed the strangest thing about the crossover – while the Simpsons using tired old comedy bits and referencing stuff that happened more than a decade ago felt tired and cliche, it to me also felt more Simpsony than even their own show had been in quite a while. For a brief moment, the characters that I grew up watching and loving were back and they felt real and authentic and more like The Simpsons than they had since their movie in 2007. While some of the jokes didn’t quite hit, I still admit that I had a huge nostalgia moment hearing things like “Eat my Shorts,” or seeing Bart prank call Moe’s Tavern. Family Guy has never been the most… shall we say detailed of animated series. The world of Family Guy and its quirky cast of characters are all drawn in an overly simplistic manner that utilises only a few different colours and some shading per section. Don’t get me wrong though, just because it is simplistic, that doesn’t mean that Family Guy looks like a budget anime, in fact quite the opposite and that has become all the more apparent every season since the show switched to HD. The main issue I have with the visuals (and this is something I have brought up regarding previous series) is that the fact that the collection is DVD exclusive and not available on Blu Ray means that a lot of that crisp imagery that would otherwise look incredible is somewhat washed down. I would love it is Blu Ray collections of the series would be released so that my TV can finally show off this program in all its glory. 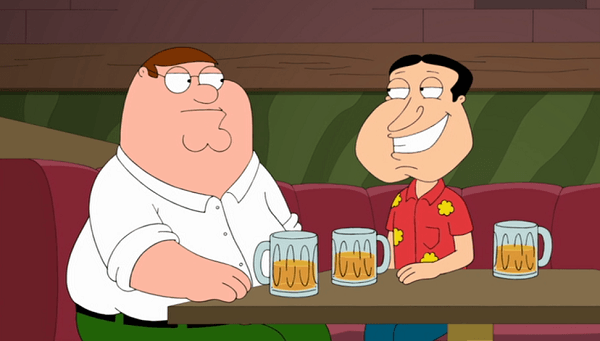 Much like the video, the Family Guy cast have definitely found their groove when recording character dialogue. Each of the main characters has their own unique sound and voice that makes them immediately identifiable even when not even watching the screen. I will say though that after fifteen years of watching the show, it is becoming ever easy to hear Seth McFarlane’s voice in all of the minor background characters. While the Family Guy cast have this down to a sport at this time, the same cannot be said for the Simpsons Crew in their guest episode. While all of the main Simpsons cast were present, and filled their roles as well as they could, something just sounded off about them – I’m not sure if it was an intentional move by the crew to show that The Simpsons didn’t really belong in Family Guy, or if it was something else, but it really took me out of the episode a few times. You know once upon a time I never really cared about the extras on a DVD. Sure I might have checked out one or two deleted scenes but that was about it. Nowadays, I find it hard to justify the purchase of a DVD or BluRay that doesn’t have a whole slog of additional content that I can sit through. 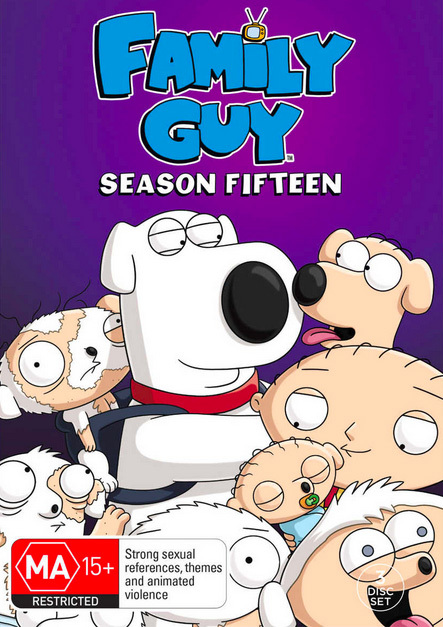 To that end, I am thankful that the guys at Fox have layered up the Family Guy Season 15 DVD with plenty of little extras. There are the typical deleted scenes which are a mixed bag that ranges from hilarious through to “Yeah I can see why they cut this.” In addition to that there are some commentary tracks and even storyboard animations for a few episode. There is plenty to watch after you’ve finished binge watching the season but something about it just fills devoid of substance. Where are the cast outtakes, behind the scenes interviews with the cast of The Simpsons etc. I’m being a bit picky, but with such a milestone for television to be included on-disc, not having the fanfare behind it is a little disappointing. I’ll admit that I love Family Guy, but I cannot deny that it is beginning to show its age. Visually, the show has never looked better than it does in Season 15 but everywhere else it definitely feels like a decline from the past few seasons. Even the hugely hyped team-up with The Simpsons was little more than a meta, cliche battle between the two franchises. That isn’t to say that there aren’t laughs to be had with this newest season of Family Guy, because I honestly did enjoy it, but it is definitely losing its magic.